Callaway Apex MB iron review: one for the real players! The classic bladed iron. A club we all aspire to play with, but only a chosen few reach the lofty level of skill required to bag them. 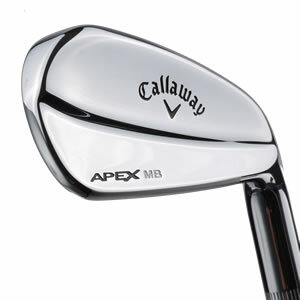 The Apex MB is the upgraded bladed iron from Callaway for 2018, and can be seen in the hands of the best players on Tour worldwide. Take a second to admire the shattering beauty of this club. It’s absolutely stunning. Thin topline and sole, traditional slightly rounded design with a one-step design on the backside. The branding is kept to a minimum, while the chrome finish is classy. They’ll be the envy of your playing partners. Just as you would expect from a 1025 carbon steel forged head – soft, pure, delightful. The feel of a MB blade cannot be beaten. New 20V grooves are implemented for improved spin and control through the bag. We certainly felt we could hit any shot we wanted, and could control spin with ease. As you would expect from a compact blade, you get unrivalled consistency with this iron. If you hit it pure, you will be on the number every time. While there is very little forgiveness on offer, we did find towards the toe this club gave us more help compared to similar products from other brands. Just what you would expect from a muscleback – outstanding feel, control and consistency. One of the more forgiving blades on the market. One for the real players!